Samsung is giving you yet another reason to ditch your mechanical hard drive with a new 850 EVO 4TB SSD. A few years ago, you'd be hard pressed to even find SSDs with more than 128GB of storage and now with this, users will be able to store a few dozen games at a time. Beyond being able to store more, the EVO 4TB features top-class read and write speeds of 540MBps and 520MBps, respectively. The new drive offers double the amount of storage compared to Samsung's existing EVO lineup and it's officially the largest consumer-grade SSD you can buy today. That said, even 4TB is about half the capacity available on hard drives. 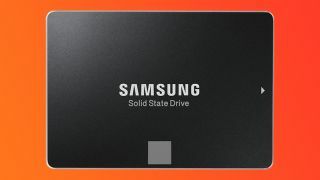 There are larger SSDs in the world such as Samsung's own 16TB SSD, which until recently was only available to enterprise customers. All of this capacity and speed comes at a steep price and the EVO 4TB will run you an immense $1,499 (about £1,155, AU$1,989) when it arrives on July 31st. For the same price, you could build a well specced gaming desktop, which will probably make it too prohibitively expensive for most users. Personally though, we can't wait for Samsung to adapt this drive into an M.2 form factor for even greater transfer speeds. And now that 4TB has come to the 850 EVO line, there's a greater chance we'll see an 850 Pro version of the drive in the future. Looking for the best SSDs?